The number of options you have when buying insurance may seem overwhelming. You can go online and purchase coverage yourself, contact a captive agent (State Farm, Allstate, Farmers, Farm Bureau, etc), or you can use an independent insurance agent/broker. There are advantages to each channel depending on what you are trying to accomplish with your insurance program. If you are only concerned about meeting state minimum coverage, appeasing your landlord, or cutting expenses then the direct insurance writer channel might be the best option for you. If you want to protect yourself, your family, and your assets then having an agent is a much wiser choice. One of the few advantages direct writers have is the convenience of being available 24/7. You can talk to someone over the phone or complete your quote online. Another advantage is their pricing, but is it really an advantage if you’ve lowered your coverage? The most important thing to know when you buy your insurance online is that you are responsible for the policy that you purchased. Did you happen to read the clause about actual cash value loss settlement? You might want to check this out. What about when an uninsured driver hits your brand new car? You only selected $10,000 in uninsured motorists property? How will your $20,000+ car get replaced? Your reaction might be similar to hers! Purchasing your insurance online could save you some time and money when you’re first looking at your insurance. However, who do you call when you have a claim? You most likely have to call an 800 number and have to navigate through a phone tree before you can finally file your claim. The direct writer’s commercials may be funny, but it’s not so funny if they don’t cover a claim. You are responsible for the contract you sign with a direct writer. That’s why it’s better to establish a relationship with a professional for your insurance so they can steer you in the right direction. The direct writers treat insurance as a commodity and do not have your best interests in mind. Some of you may not know what a captive agent is. A captive agent is a licensed insurance agent that represents one insurance company. Insurance companies such as State Farm, Allstate, Farm Bureau, and Farmers all sell their insurance products through a captive agent. There are some advantages to using a captive agent. The brand recognition of captive agent companies is seen everyday in their countless advertisements. We are all familiar with the companies and what they have to offer, which establishes a feeling of comfort for most consumers. That feeling of comfort and security is vitally important when it comes to your insurance. There are also plenty of direct agents in just about every town across America. So, if you decide to move to another state you can likely just switch to a new agent and stick with the same insurance company. However, what isn’t conveyed in their commercials is the language in their policies. For instance, do you know what a percentage deductible is? Let’s say your house is insured for $400k, but you find out when a hail storm comes through and your roof is damaged that you have a 1% deductible. That means you’ll need to come up with $4k out of pocket to put a new roof on your house. On top of that, what if you also have an actual cash value settlement on your roof? On the same $400k house, a new roof may cost $10-$15k. At the time of the claim, your roof was 15 years old and the insurance company determined the actual cash value is only $4k. Now, you’re going to need to pay for the roof yourself since your deductible is $4k! I have to pay what out of pocket?! What if you drive for Uber or Lyft? Did you know that there are some major gaps in coverage? Check out this article on the coverage you need as an Uber driver that is only available through a select few insurance companies. Most insurance companies are now going towards the percentage deductibles and actual cash value on roofs. Yet, there are still plenty of companies out there without these restrictions. The captive agent only has access to the one company they represent and they cannot switch you to another company if you are dissatisfied with their company. Captive Agents are an advocate of their insurance company and not you, the consumer. Lastly, a captive agent’s solution to reducing premiums is cutting coverage or referring you to an independent insurance agent. Why should you limit yourself to just one company? If you are like most consumers, you like to have options and make an informed decision before making purchases. Independent insurance agents have access to several companies for all kinds of insurance. Whether you are looking for auto, home, business, life, or health insurance. Okay, maybe not health insurance so much anymore, but we won’t go into that. You get the point, independent agents can provide practically any kind of insurance product you are looking for. The motto for most independent insurance agents is that “we do the shopping for you” or something along those lines. Yes, that is absolutely true. However, at PRM, we like educate our prospects & clients about the risks they face as an individual, family, or business. Our licensed staff is here to guide you through your entire insurance journey. From when you first become a client to the time you buy your first house, buy your first brand new car, have your first licensed teenage driver, and most importantly when you have a claim. 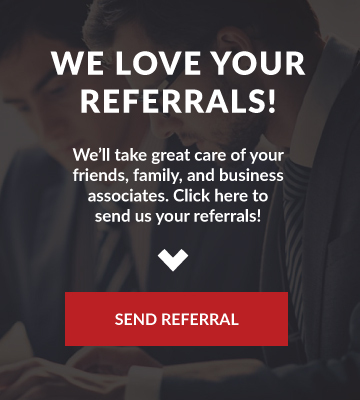 Our agency can be your one point of contact for all your insurance needs! Ultimately, a local independent agent is an advocate for you. One of the biggest advantages of using an independent agent is the objective advice we provide. Since we are not tied to just one company, we can search the marketplace for the best fit for you, your family, or your business. Speaking of your business, did you know that over 80% of business insurance is insured by independent insurance agents? 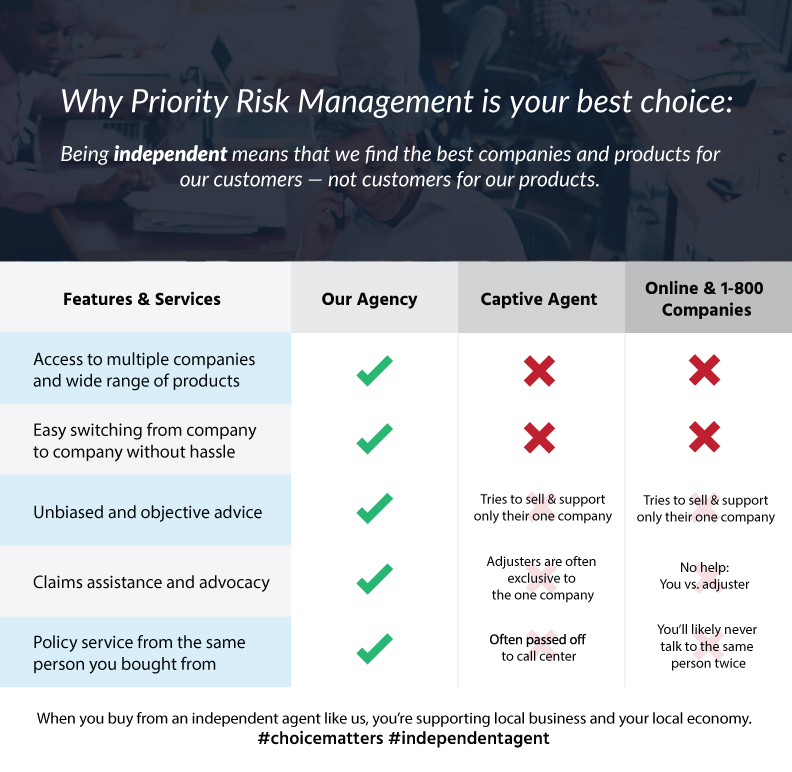 IndependentAgent.com elaborates on the impact independent agents have in commercial insurance. The main factor driving the market share in the independent insurance agent’s favor is their expertise and product offerings. We undergo extensive training to become knowledgeable about the policy forms for commercial insurance and can obtain designations proving our worth. Frankly, captive agents and direct writers have limited policies available for business owners and aren’t equipped with the tools to insure most businesses correctly. My personal belief is that we buy insurance for protection from unforeseen catastrophic events – car accident, fire, tornado, etc. This is the independent agent’s biggest competitive advantage. You can call our office and talk to the same agent that wrote your policy. 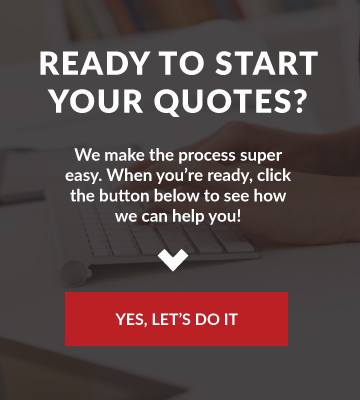 We know how our carriers handle their claims and will be able to guide you through the process. Our priority is to make sure your claim goes smoothly and get you back on your feet as soon as possible. I hope this article has been helpful for you in your insurance buying process. 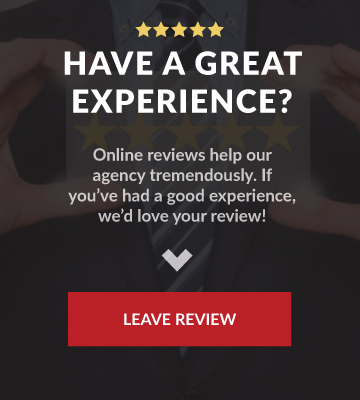 We’d be happy to review your policies or you can click here to get a quote.